A gas giant located about 260 light-years from here has winds that howl at the speed of sound and a day side that's hot enough to melt iron. We know this because astronomers have just made the most detailed weather map of the temperature of an exoplanet's atmosphere. Here's the forecast for WASP-43b. This exoplanet is the size of Jupiter but with double the mass and an orbit that places it closer to its parent star than any planet in our own solar system. It features one of the shortest years ever measured for an exoplanet of its size — a mere 19 hours. So this thing is absolutely blazing around its star. Two new studies (here and here) are offering a glimpse of what the weather's like on this thing, along with the amount and distribution of water vapour within. It's considered the first of its kind in terms of providing a two-dimensional map of a planet's thermal structure. What's more, the maps are helping astronomers — or in this case, exometerologists — to predict how heat is transported from an exoplanet's hot day side to its cool night side. Indeed, WASP-43b is tidally locked, meaning it keeps one hemisphere facing the star (similar to how our Moon keeps one face towards Earth). Using Hubble, the scientists determined that the planet has speed-of-sound winds and a day side that soars above 1,500 degrees Celsius. Its pitch-black night side drops to a rather "cool" 500 degrees Celsius. Laura Kreidberg from the University of Chicago explains. 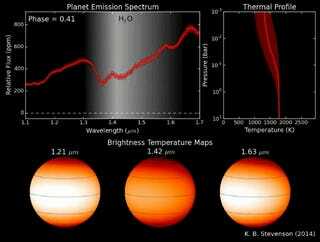 To make these observations, the WASP-43 team used transmission spectrography, which filters the parent star's light through the planet's atmosphere. They measured water abundances and temperatures at different longitudes by taking advantage of the precision and stability of Hubble's instruments to subtract more than 95.5% of the light from the parent star. This allowed them to study the light coming from the planet itself, a technique called emission spectroscopy. "Space probes have not been able to penetrate deep enough into Jupiter's atmosphere to obtain a clear measurement of its water abundance. But this giant planet is different," added Derek Homeier of the École Normale Supérieure de Lyon, France, co-author of the studies. "WASP-43b's water is in the form of a vapour that can be much more easily traced. So we could not only find it, we were able to directly measure how much there is and test for variations along the planet's longitude." Which is an important clue in understanding how the planet formed.